This design is meant to serve as an atom kit for the visually impaired. 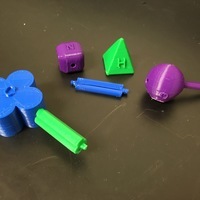 Typical atom kits contain various sticks for representing single/double/triple bonds and contain four elements that are represented by different colors (Oxygen, Hydrogen, Nitrogen and Carbon). To make it more universal, we have redesigned each element into different shapes (with reasoning for each chosen shape below). Each atom also has its atomic symbol inset into the shape for feeling. 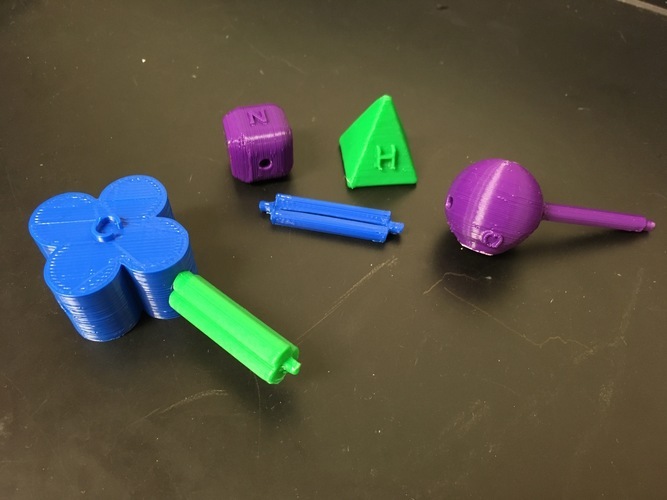 I tried to shape the carbon like a four-leaf clover because carbon can have a maximum of four attachments, and feeling the four attachment sites would be an advantage for the visually impaired. I tried to keep oxygen spherical to resemble the letter O. Hydrogen is a pyramid, with only one attachment hole at its base, because hydrogen can only have one single bond with any element. Finally, the only simple shape left was a square, which I thought would work for Nitrogen. It has three holes, as Nitrogen usually bonds with three other atoms; you could definitely add a fourth hole if you wanted to. I made single, double, and triple bonds as well. The single bond is just a skinny cylinder, whereas the double bond consists of two small cylinders and the triple bond has three distinct cylinders one can feel. Every element, in addition, has its letter embossed on the surface. FYI - all the pieces show up really small in Cura, so they all have to be scaled to 10.0.